Whether you are a beginner in the design world or a mature interior designer this article can help you with some basic steps in creating your first portfolio; also you may find here some fresh and interesting ideas for an existing one. Some paragraphs here I took from my best-selling book “The SKETCH“. Enjoy! P.S. Very special gift at the end of the article. You need a portfolio to show people so that they can see what your design skills are and what your expertise is. It should be professionally looking and attractive from a design perspective, yes, but content is king, never forget about this, that’s why I’m going to be covering here necessary things to include in your interior design portfolio. To begin with, let’s define your «target audience» as that will affect the content. Who will see your portfolio? Is it an employer, a potential client, or maybe people from interior design college you want to apply? Think about it and then you can create a killer portfolio that will blow their minds! Remember, your interior design portfolio can actually prove you are a professional without you saying a word! Your portfolio can also set you apart from other designers and present your work in the best possible light. Visuals speak loud. Design speaks even louder. I bring secrets of hand rendering from the best Russian Art Academy to interior designers all over the world! Are you a beginner in the design world? Do you lack experiences? Then in your portfolio, you can obviously show off your school/university assignments that you really like. Select your best projects that you are most proud of, show your best work. Five to seven projects are usually enough. Let’s assume that your «target audience» is an employer. On the first page of your portfolio, it’s a good idea to include your photo and resume. Make sure to keep your resume nice and relatively short. This is a great way to start out your portfolio as it gives a great overview of your skills. Plus, your resume should be attractive, take your time and check some design resume templates online (like this one) or create one yourself. Next, continue with your projects (commercial design, hospitality industry, residential projects), then you can include paid projects you did on the side if you have ones. Make sure you have correct categories displayed. The important thing is to keep everything clean and crisp as it will make your portfolio look professional. You should prove with your beautiful presentation that you are a skilful interior designer. Include pictures of some design boards, you’ve had created, because it’s a lot easier to carry around pictures as it shows the work well enough, plus it gives your future employer a really good overview of your skills. You can get each step of this sketch plan in PDF on your email, simply complete the form below! Be sure to demonstrate your technical skills, include your CAD drawings, show that you can draw out and design a plan, add a couple of electrical drawings and any other special drawings or special skills you may have. Another great idea is to demonstrate a progression of a project from initial concept to final design. Here you can show your very first sketches, mood boards, AutoCAD floor plans, and any other mechanical plans, elevations, and 3D renderings. If you can sketch and make perspective drawings and hand renderings, include them as well. Clients really love hand drafts as this ability to draw makes them think that you’re an Artist. Show your wide range of talents. At the very end of the portfolio, you can have your references. Please remember that interior design is not the same as interior decorating, that is the one big mistake people make all the time. Some customers really think that we just select pillow cushions, and blankets, and picking wall colours all day long. To be true, that is about 10% of what we actually do. Interior design is essentially like architecture, in some countries, it’s even called «interior architecture». You can get your diploma in interior decorating in 2-3 years, whereas interior design typically is a four to six-year degree program. In interior design, you learn about constructions, floor plans, history of interior design, styles, functionality, ergonomics, lighting, colour theory, client communication, building codes, mechanical systems. It’s a lot more than just designing a room. In this article, I will cover the decorator’s portfolio as well so keep reading. Well, here, in an interior designer’s portfolio, your «target audience» can be both a potential employer or a client. Looking for a position in interior design or architecture firm? Your resume, in that case, should cover your educational background, experience, and qualifications. My recommendation is to focus on your professional skills in this type of portfolio. It’s also a good idea to demonstrate a progression of a project from the concept to the final design, show your sketches, sample design boards, floor plans, and any other mechanical plans, elevations, and final 3D renderings. Your resume here can cover not only your experience, educational background, and qualifications but also your design philosophy. Remember to add contacts or your business card. Include client recommendations if you have any, testimonials work better than anything. Show what your customer wants, if he came to you for a residential project, show him your completed projects of apartments, studios, duplexes, houses etc. I mean at least 80% of your portfolio should be residential, other 20% you can make commercial if you wish. Try to include real photos, not only 3D renderings, layouts, mood boards and drawings, as photos of completed projects will dramatically enrich your portfolio and gain the trust of the customer. Every time you finish a project, hire a photographer or a friend of yours who can make professional photos of your accomplished interior. 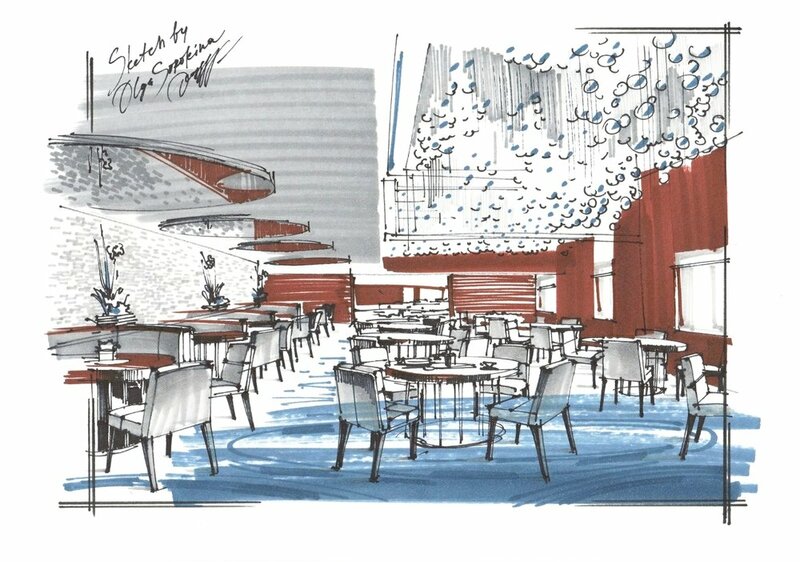 Focus on visuals: photos, 3D views, hand renderings, and sketches, clients really love it. Try not to overwhelm your customer with technical drawings and AutoCAD layouts, the majority of them won’t understand all that stuff. Here I used Chartpak and Copic markers. Include project location with its start and completion dates, describe the client’s directive. Keep it short and sweet. You can use here «before» and «after» photos. If you have any publications in interior design magazines, design awards, include them as well. Add certificates and any other documents that show your accomplishments. You want to sell with your portfolio your creative services and your expertise. Remember that the best interior designer with the worst sales skills will never have as much business as the worst interior designer with the best sales skills. Think about what your client really wants and needs and how you are going to be able to deliver on those wants and needs. How he will benefit from you rather than the other interior designer? What value do you bring to the table? Another important thing is to keep your portfolio up-to-date, so check it once a year or every other year and delete some outdated projects and include your new designs. If you don’t want to offer it, don’t show it, let it be your mantra for the portfolio creation process. I mean if your goal is to work on restaurants and hotels in a contemporary style, don’t show your clients examples of residentials in classic. So you are a brand new interior decorator and you don’t have a portfolio built up yet. Let’s assume that your «target audience» is a potential customer. If you have not yet been able to do your first real design project, my advice is to create an imaginary one, but following all the steps of a real project. You can include some educational projects you’ve done such as private, commercial, hospitality interiors. The simplest and fastest way to fill in your portfolio with projects is to create mood boards. It’s not the most sustainable option, but if you are on a deadline it can be the most effective solution for you. Visuals speak loudly, they really do, people absolutely love to see visuals! Why do you think Instagram and Pinterest are so popular these days? Spend a couple of days and create mood boards for imaginary clients; for example, dream up a studio apartment for a young couple, a living room for an architect, an apartment for fashion designer and so on. Create all sorts of rooms and spaces for whoever you can dream up. Take it seriously, think about these people and what their lives are. What you envision their space to be? Create a bunch of mood boards and put those on your portfolio. A great idea would be to accompany those mood boards with floor plans in order to show your technical skills and knowledge of ergonomics. A huge benefit to doing that is that you can nail down your process so you can know how much time it takes you so in a situation with a real and not fake client you know how to charge properly for your expertise. You need a good portfolio to get accepted into interior design school or university. Usually, you have to have good grades as well because it’s a competitive program. In this case, your «target audience» is, as you can probably guess, selection committee. First, I would recommend checking their website, most programs will have a list of requirements that they would like to see. They want it clean and simple, just show your artistic abilities so that these people know that you do have some sort of design background. The main thing here is to practice your perspective drawing (especially 1 and 2-point perspective), floor plan drafting. Check my free ecourse where I cover basics of 1 and 2-point perspective. Usually, you had to go for an interview and show them pieces of artwork, life drawings, classic still-life drawings, maybe Photoshop collages, you have to show your artistic abilities and that you could drop. Just collect your art pieces, make photos of them. You can simply create a digital portfolio in Word or PowerPoint by labelling your art pieces (add sizing and description, for ex. 50x60 cm, oil on canvas, name, etc). 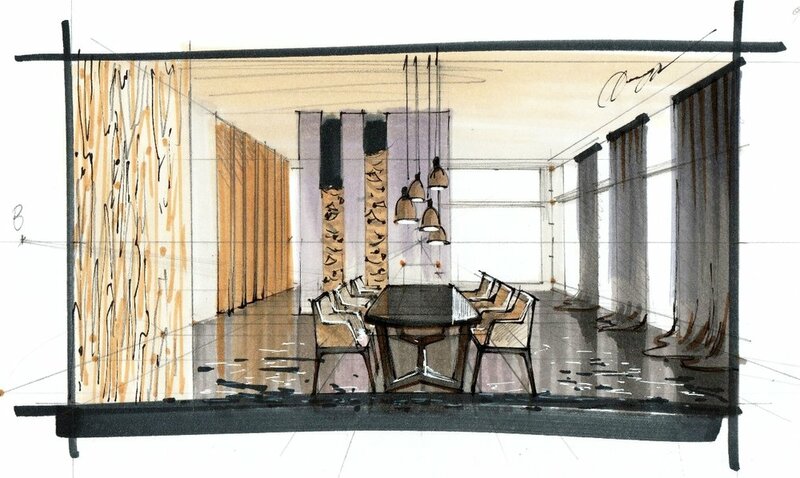 When entering an interior design school it is a great advantage that you have those drawing skills. Remember that each design school’s committee wants the best possible students to study in that school because their successful graduates and their testimonials are their best ads and marketing tools. Good luck to you if you are currently applying for colleges or universities! If you choose a printed version I would recommend horizontal A3 format (it is portfolio classic) as in square, A4 or vertically oriented format it’s harder to make a good composition and show your projects properly. Make sure you use high-quality images for your portfolio so they look nice when printed. Use high-quality paper, the feeling even texture of your portfolio, fonts, and colour brightness matters. Online or PDF format is so popular now, it’s eco-friendly and it’s biggest advantage is that colours look so much deeper and brighter in comparison with the printed version. You can create your portfolio in Adobe Photoshop, Corel Draw, InDesign, Apple Pages, Keynote, PowerPoint. Select the program you love and feel familiar with. P.S. My dear Reader, please like this article below and share it on social. Thanks in advance and good luck with your portfolio! I’m sure it will look amazing! Any questions? I would like to hear from you, my dear Creative! Thank you for your email! I normally answer within 2-3 working days. Have a creative day ahead! CHECK OLGA'S FREE PERSPECTIVE CHALLENGE!